On May 3, we began our journey at 2:30 am on the dot at the MHC Equestrian Center. 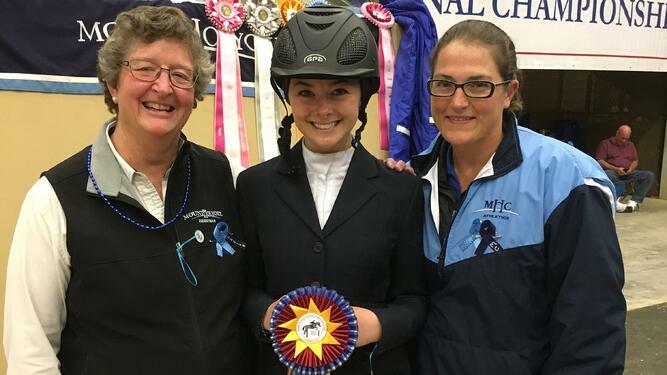 We had spent the past month juggling finals with intense efforts to fine-tune our equitation. We rode in near daily lessons, took lunge lessons, shared constructive criticism as a team, and “hacked” (riding a horse outside of lesson hours). With coffee in hand, it was now time to catch our early morning flights. Kentucky could not have been better to us. White fences lined the roads, behind which danced young spring foals. The 20 of us on the team who went were glued to the van windows as our coach, C.J. Law, told us about the area’s rich horse history and stories of nationals past. Once we made it to the Alltech Arena at the Kentucky Horse Park, our home for the next four days, we got to work strategizing. We watched our potential horses “schooling,” or getting familiar with the ring and fences. We took notes, walked courses, and took every opportunity to ride. The first show day was a day of excitement and nerves. The sun wasn’t up yet as we drove into the park. Ten riders competed: eight rode for the team and two rode individually. By the time the sun had set, five riders had won ribbons. We were in 11th place. Friday could not come soon enough for me and the three other riders who were set to compete. I watched my teammates rise to the occasion. Their consistent performances helped our team ascend in the ranks. Just before 7:00 pm, I finally mounted Collins, a beautiful horse from Cazenovia College. 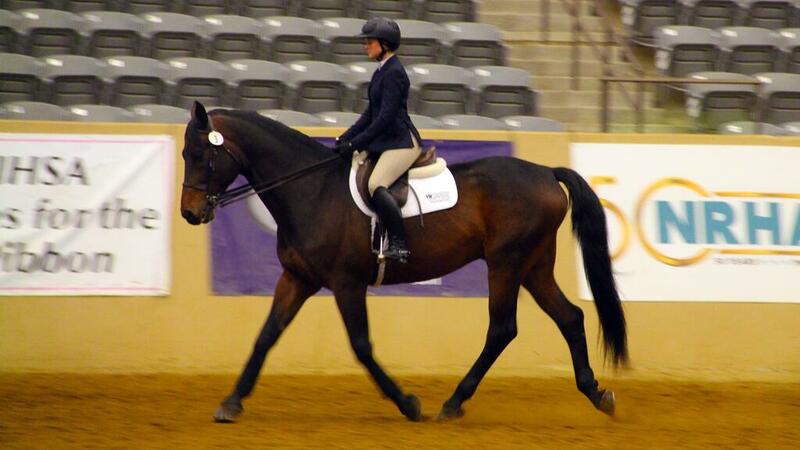 Riders never know their horse until they draw one randomly before their class. We had been matched up earlier in the day by a live draw process involving tokens and numbers. I had drawn a toy horse with Collins’s number on it. 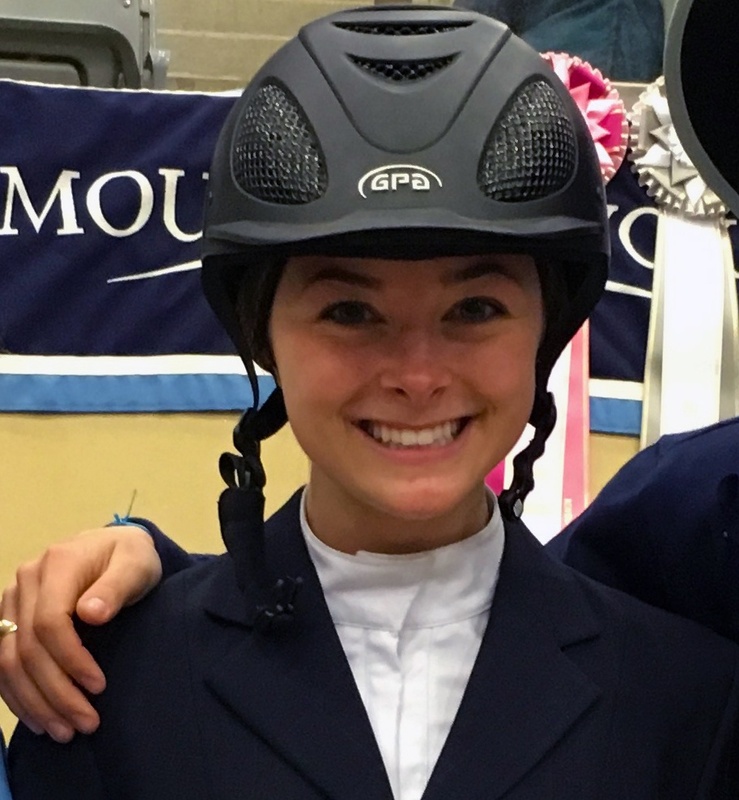 My teammates buzzed around me in the horse-show routine of adjusting stirrups, polishing boots, and fixing collars and helmet harnesses. Prepped and ready, it was my time to shine. Collins and I paused at the ring entrance, which increased the space between us and the other 15 riders and helped us stand out. As we maneuvered around the ring, Collins carried himself in a graceful manner. We swept down the long side of the ring, showing off as best we could. I could see my teammates trying to get the best view by the out gate, huddling close together. When my number was called, announcing that I was to remain on the rail for further testing, my team stirred with excitement. The ring fell silent as I made my way around the arena with only four other riders. Collins and I landed precise transitions and smooth gaits. To set myself apart, I tried to stay in direct sight of the judges—and away from the competition. The judges called for us to return to the lineup and then dismissed our class. Collins and I made one more lap around to make a last impression on the judges before heading to the holding ring. The next time Collins and I reunited, it was in the winners’ circle. I had placed first in the Collegiate Cup Walk-Trot-Canter class! When the announcer read my name as my class stood in the center of the arena, I couldn’t believe it. My teammates jumped, screamed, and cried. I tried to stay composed as we lined up and took pictures. As I walked out of the arena my team swarmed me, patting my helmet and grinning with pride. When I met C.J. on the other side of the blue army, she smiled and hugged me. All of the effort we had put in to get to this moment had paid off. I was lifted back onto my horse to head to the winners’ circle. 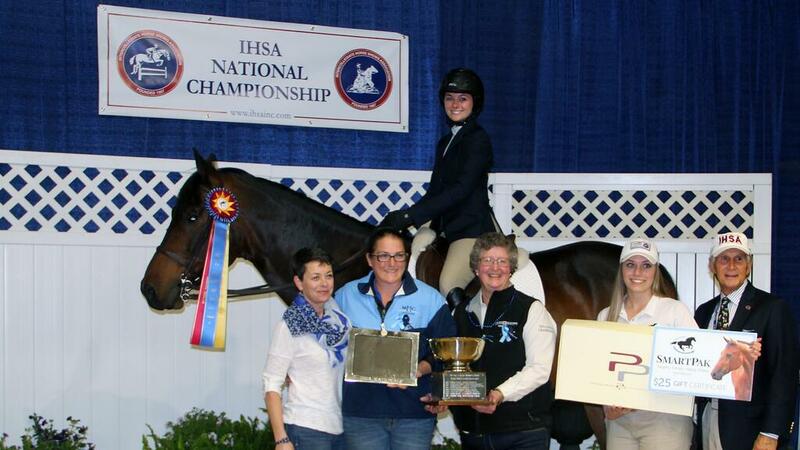 Collins pricked his perfect ears forward as my coaches, mom, sponsors, and Bob Cacchione, the IHSA founder, posed around us. Nothing can describe the feeling of being up on that beautiful horse in that moment. As I looked out at my team, phones raised to take pictures, arms intertwined, I felt so lucky to be there with them. I hope to remember this feeling as I continue to work hard and improve. 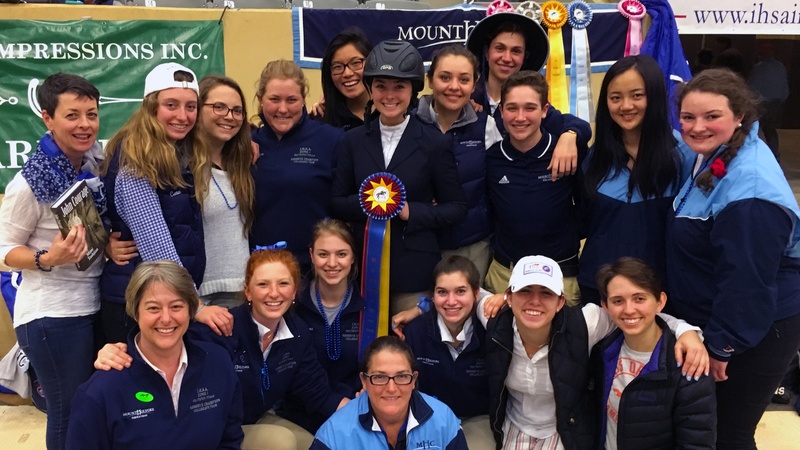 MHC Eq took home the title of 2016 national Reserve Champions. I am so unbelievably proud of every member of MHC Eq for getting us there. And I couldn’t be more grateful to be a part of the blue army. What will your moment be? Photos above are courtesy of C.J. Law.